Home > Posts tagged "nutrition"
Body Transformation: Catherine Biery Busted Into A Figure Physique! My weight skyrocketed during my 20s due to lifestyle choices, low self-esteem, and poor relationships. Even though I earned a bachelor’s degree in exercise science, I couldn’t get my weight under control. At one point, I got up to 175 pounds on my 5-foot-3 frame. I started dating my husband in my early 30s, regained some of my lost self-esteem, and became more serious about exercise and nutrition. I became a cardio queen and steered clear of the weight room. I ran on the treadmill for hours and wondered why I didn’t lose weight. My husband later introduced me to weightlifting and I loved it. I developed a passion for strength training, slowly lost weight and eventually hit 135 pounds, which felt amazing. Rather than focusing on being skinny, I wanted to be strong. I became pregnant at age 33 and gained weight again, but weighed less than I did in my 20s. I lost all of my pregnancy weight with continued training. I also paid attention to portion sizes by measuring food in a food journal. I was mostly fit again but wanted to take it to the next level. My ultimate goal was to compete in a figure. I learned about figure competitions years before, but always assumed I wouldn’t make it to that level. The physical and mental strength required to accomplish my goal seemed inspiring and appealing. Before my daughter turned 3 years old, something clicked. I realized I could accomplish my goal if I set my mind to do it. I wanted to set a good example for my daughter who could watch me follow through with something important. A fire was ignited inside me at age 37. I was ready to see what I was made of, so I cleaned up my diet, increased my training, and watched myself transform. On November 16, 2013, with support from my family and friends, I competed in my first figure competition. My confidence and inner strength are through the roof. I feel better mentally and physically now than at any time in my life. I’m excited to see what the future has in store for me and am excited to compete again. Accomplishing my goals felt like a rollercoaster ride with many ups and downs. When I made the commitment to compete, I was determined to follow through. I wasn’t going to let myself down. I vocalized my goal to my friends and family who became my support team. Having their support motivated me when times got tough. It would’ve been easy to quit if I hadn’t let those I care about join my journey. The month before my contest was tough physically and mentally. I reached out to my support team on tough days and asked them to send me their favorite motivational quotes, stories, and experiences, which helped a lot. On tough days, I’d look to individuals I admire. I visited Erin Stern’s Facebook page often and read transformation stories on Bodybuilding.com. I also read fitness magazines for new workout tips and clean-eating ideas. Most of all, I thought about who I wanted to be for myself and my daughter. I want her to know that it’s important to chase and complete your goals, even when it’s hard and you’re afraid. I’ve been told countless times by friends, family, and random strangers at the gym that I inspire them. If I told my 20-year-old self that one day people would say that I inspire them, I would’ve never believed it. It’s those moments that keep me motivated to push toward my future goals. I drink at least one gallon of water per day and increase that to two gallons per day three weeks before competition. This is my maintenance diet that keeps me running like a well-fueled machine. I strength train six days per week and work each muscle group twice per week. I also do 3-4 hours of cardio per week on the stairmaster. The most challenging part of my transformation was three weeks out from my contest date. I increased my cardio from four to seven days per week and depleted additional calories from my diet. The combination left me with low energy and an energetic 3-year-old to keep up with. Knowing it was temporary kept me going. I leaned on my husband and support team for motivation and visualized myself on stage completing my goal. I learned a lot from my first figure competition. I met many wonderful people and had fun. I’m excited to get back on stage and do it again. I have specific improvements that I want to make for my next show and will give myself a few months before I step on stage again. Even though I have a bachelor’s degree in exercise science, I was too embarrassed to pursue my dreams and help others meet their fitness goals because I hadn’t completed mine. I now have the confidence to pursue it and plan to become a certified personal trainer when my daughter is in preschool. Believe in yourself and make long-term changes. Surround yourself with positive people to lean on when you need help. Seek inspiration from others who have been there to ignite your inner fire. Keep a food log and measure your food. Don’t obsess about the number on the scale! My husband and I use Bodybuilding.com for our supplementation needs because it has the best prices and fastest shipping. Bodybuilding.com keeps us happily stocked with supplements and motivates us with articles and transformation stories. Blocking out the time to really delve into a stretching session can seem hard to justify if your busy schedule already makes squeezing workouts in difficult.But if you’ve found yourself hitting a wall when it comes to results, or you’re constantly plagued by niggling injuries, it might just be what the doctor ordered. US-based Lastics has taken inspo from the long, lean and limber bodies of dancers to come up with classes and online videos to help regular gym-goers get the most out of their workouts. ‘Dancers epitomise the balance between strength and flexibility to the extreme,’ says Lastics founder Donna Flagg. ‘Their bodies are graceful, sculpted and powerful.’Rather than overhauling your entire workout routine to emulate that of a ballerina, Lastics instead allows you to simply take a leaf out of their book, providing stretching-focused classes to help you develop an improved range of motion. High Reps, Low Reps? Which Rep Scheme Is Best? Bodybuilders and strength athletes stop making progress for one reason: They stop coercing their body to adapt. Note how I intentionally use the word coerce, not a connotatively weaker action verb like force. The reason is that once you’ve been in the training game long enough, your body grows wiser and you realize that you can’t simply force it to do anything anymore. When you continue to push and grunt with no concrete strategy other than “hard work,” you get injured or beat-up. Few things devour reasonable progress faster than what we’ll call “middle ground” training. That is, always training with the same set or rep scheme and with the same intensity. If you default to training in the 8, 10, or 12 rep range, I hate to break it to you, but your growth is simply wallowing in no-gain’s land. Fortunately, there are tools in the training toolbox that will sharpen up your training. Let’s start with a brief overview and then move on to how these can be applied to your own programming to maximize growth and development. The first order of business is to focus on a key element of training: The neural-metabolic continuum. It’s a fancy term that allows you to understand whether you actually work your muscles or central nervous system (CNS), based on key variables. For the sake of brevity, here’s a visual breakdown of what it looks like. Are we clear on the layout of the neural-metabolic continuum? Good, now let’s look at why you need to spend time in both ends (and not the straight middle) to maximize your growth and development. By now, it’s probably ingrained in you that you need to perform high reps per set (I’m looking at you, bodybuilders). Let me clarify that I define high reps to dawdle in the 8-12 rep range but could be as low as 6 reps per set. There shouldn’t be anything really earth-shattering here. If you train with high reps, your goal is to build a bigger muscle. Some folks call this “structural hypertrophy” since the higher rep sets allow you to focus primarily on the muscles themselves. They also lend themselves to fewer total sets per exercise. By virtue of slowing down the movement, coupled with the sheer amount of reps you do per set, you’re going to increase time under tension, which is a necessary stimulus for hypertrophy. No doubt, gains in strength will come along for the ride, but increases in muscular growth will outpace the increases in strength. But what happens if you spend all your time here? Quite simply, your body will adapt to your training in this rep range if you continue it for extended periods of time. Furthermore, training in that zone will ultimately limit the amount of intensity you can use as well. 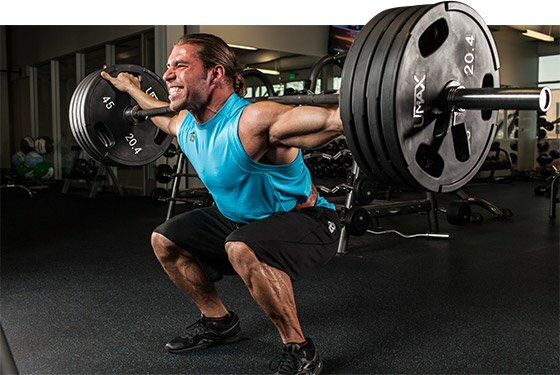 Do high-rep sets (15, 20, or more reps per set) have a place in programming? Sure, but they’re probably the exception rather than the rule. The solution here is clear: Focus on getting stronger! High reps deliver big gains, right? Well, low reps have a place, too! The low-rep zone can be defined as anything between 1 rep with near-maximal effort and 5 reps in a set. They’re often viewed as being geared more for powerlifting or Olympic lifting, but if you really want to make high-threshold motor units work, you will need to push some serious weight! This focuses on making your nervous system more efficient. If you switch from sets of 10 to sets of 3, you coerce your body to unfamiliar, shocking stressors, especially since low rep ranges encourage the use of much heavier weights. Every movement requires more “tightness” and a more intense focus. Further, more motor units and muscle fibers are recruited, and your body gets better at turning off antagonists (or opposing muscle groups) as well. The result is that you’ll get jacked, but in a slightly different way. Since the goal is more on strength, your body composition will greatly differ from someone who performs exclusively high-rep sets. Powerlifters are strong as hell and can move jaw-dropping weight, but probably lack a bit of the size and definition of a well-trained bodybuilder. So if high reps promote hypertrophy and low reps facilitate strength increases, then in theory, the marriage of both rep schemes will bring forth muscular and strength development worthy of the Greek gods. You need to spend dedicated periods of time in both the high-rep and low-rep ranges to maximize your development. High reps build muscle and connective tissue strength, and give your body respite from the grind of low-rep sets, too. Similarly, low-rep sets build neuromuscular and CNS efficiency. When you become more efficient and then go back to your big lifts, you can use even more weight than before, because you’re just that much more efficient and effective. These aren’t hard-and-fast rules. There may be times when even higher reps (15-20) could be used. On the flipside, there are other times when you may want to push the weight and work in the 1-5 rep range. The biggest benefit from switching between these two ranges is that you’ll constantly coerce (there’s that word again) your body to adapt, to grow, and to improve. Can’t I Just Train Everything at Once? I know some people really like undulating periodization, in which you hit different set-rep schemes on different days of the week. With this weekly program, you hit everything in one training week, thinking it’s smart, efficient training. This is true if you’re newer to lifting or have never tried a protocol like this before. However, as you get more and more advanced, this type of scenario won’t work nearly as well since you’re sending multiple mixed messages to your body. Monday’s workout would tell your body it’s time to get big, but then Wednesday’s workout will kick your body into a bit of strength mode. Finally, Friday’s workout will run counter to Monday’s and place the emphasis on raw strength. What is a confused body to do?! As you become more proficient, you have to dial up the focus and be the orchestrator to your symphony of muscles (and thus, training). It’s kind of why an elite level sprinter can’t simply wake up one day, decide to run a marathon, and hope to be awesome at both distances. While I’m saying that you need to spend time on both ends of the neural-metabolic continuum, you need to have some patience and zero-in your efforts on one at a time. The general rule is to spend at least 4-6 weeks focusing on one end before you even think about heading to the other. Hopefully, you’re now alternating between periods of high-rep and low-rep training—awesome! The next step is to alternate the level of intensity over the course of the training cycle. Think of the following quote: “A peak is surrounded by two valleys.” You can’t expect to go at 110 percent intensity every time you train. You’ll only burn yourself out. Layer-in days of high intensity combined with days of low intensity. As you can see, I’m not trying to move the same weights or loads on a week-to-week basis. In week 1, I build a base and get a good weight to build my base from. In week 2, I push the limits of my volume. In week 3, I deload. Basically, that means I lower the intensity and volume to make it an “easier” work week, allowing my body to recover and supercompensate. Finally, in week 4, I go for broke with regard to my intensity. Try using this for your squat sometime—it works great! In this example, I use a stair-step approach to prepare you for week 3. After that, you deload and get ready to run the cycle again on week 5. With these examples, the point I’m driving home is that you can’t go hard every single week. Instead, “wave” your intensity and build up to a series of big workouts, then back off to allow your body time to recover. If you want to get the most out of your training, you not only need to work hard, but you need to work smart. By training on both ends of the neural-metabolic continuum and incorporating undulating waves of intensity into your training cycle, you’ll not only see better results but you’ll incur fewer bumps and bruises along the way. Ask The Pro Trainer: How Important Is The Number Of Reps I Do? I’m a trainer of celebrities and VIPs, an IFBB Men’s Physique Pro, and a fitness advocate. I’d like to help you reach your goals by answering your tough questions! If your rep scheme isn’t getting you where you want to be, then add an additional exercise to snack on after the main course. Rest when you’re dead! Going beyond failure doesn’t have to put your spine at risk. Discover cheat-centric reps and add a valuable new muscle-building tool to your arsenal! Stuck in a rut? If you exercise regularlybut can’t ﬁgure out how to smashplateaus, you’re in the right place.This plan, by IFBB ﬁtness pro Fiona Harris,will trim inches off your thighs, tone and sculptyour arms, perk up your glute-ham tie-in,and create deﬁnition like your Insta-idol@NicoleMWilkins. By manipulating variablessuch as intensity and frequency andincorporating different training techniques—like heavy/low-rep and light/high-frequencybody-part splits, plus cardio, HIIT, andplyometrics—you WILL keep your bodyprogressing right to the top.